As I sit at my computer this morning while parked on the edge of the Smoky Mountains, I thought about the early RVers (aka pioneers) who decided to ‘Go West’ to a land that was flat and fertile. Leaving the comforts of their homes, families and friends in Virginia, North and South Carolina they headed west searching for a new life and happiness. As the coastal waves and rolling hills where behind them, they encountered the Appalachian Mountains. Here they faced what seemed like an endless climb to cross of the mountain range. I thought about their courage and strength that fueled their desire to push on and not turn back. It was courage and vision that led the pioneers to leave behind a comfortable, settled life and trek West to begin a new life in a new place. Many of those from the East that went West found a strength within themselves that they didn’t see while they were in their old life. Instead of being one of those that just kind of went along with the others in the old life, they became leaders and visionaries in their new lives. I borrowed this comment from Terry and Jo Miller, who inspired me to take on the pioneering spirit when I struggled with retiring in 2011 so we could begin our RVing life. You can read about that emotional journey here. In the past two years, we have driven our RV to Maysville, North Carolina; Blue Ridge, Georgia; Piney Flatts, Tennessee, and to Ledbetter, Texas; then back east to Jasper, Alabama; Monroe City, Missouri and our winter resting spot in Townsend, Tennessee. We encountered excitement, met new friends, and have seen some beautiful country. This is not to say we have not encountered difficulties or challenges along the way. As an example, in the last two days, we encountered a our first minor snow storm and long-term cold freezing weather. We’ve learned to adapt and be flexible. Today we have so much to be thankful for that the list would just go on and on. Instead of doing that, I would like to say that I am most thankful for my wife’s maternal grandparents. Blanche Barrett (aka Mom ‘B’) and Bill Barrett. Mom ‘B’ was the person who planted the seed of Jesus in my heart in 1966, one year before my wife and I married in 1967. Their Christian walk had a tremendous impact on my life and spiritual growth. I am thankful that we have two beautiful daughters and their families. I am thankful for our health and our friends. I am especially thankful for the joy we’ve met along the way. And I am thankful that our future is secure in knowing God is directing our lives and leading us on to new adventures. May the God of Peace and Comfort bring joy and blessings to you and your family. Thanks for stopping by, y’all come back now. Cades Cove is the single most popular place for visitors to the Greater Smoky Mountain National Forest. We are fortunate to live about 11 miles, or a short 40 minute drive, away. This gives us an opportunity to explore the details of this beautiful place. Thursday 11/21 was our second trip to Cades Cove. We first drove through the cove on Wednesday 11/13 and realized it is not possible to see all that Cades Cove has to offer with a single day trip. When we were in Blue Ridge, GA during the summer of 2012, we drove past Tremont Outdoor Resort taking the left fork onto Old State Highway 73 (Little River Road) towards Gaitlinburg. This time we took the right fork onto Laurel Creek Road. The first stop on the side of the road was to capture the beauty of Little River West Prong. One can only imagine the water flow through here in the Spring, The large retaining wall on the left photo protects the road way from washout. 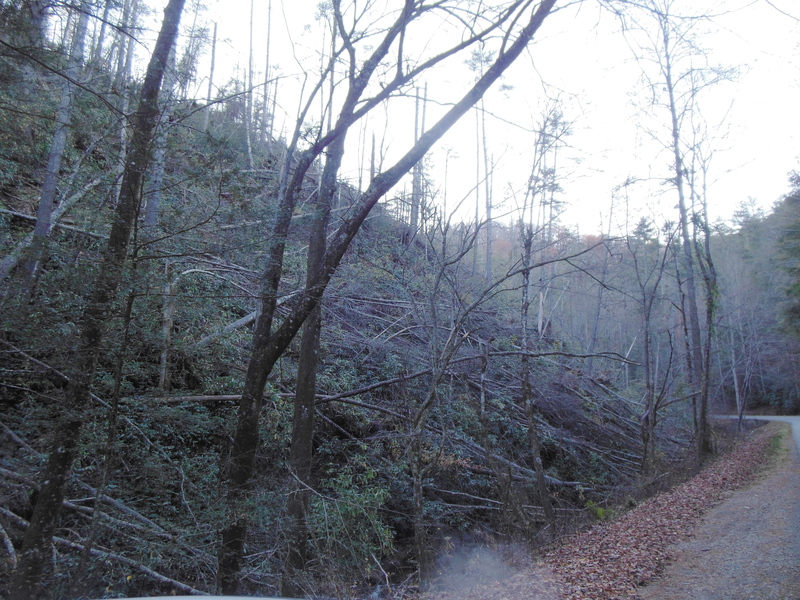 Continuing the drive to Cades Cove, we came across a section of the Smoky Mountain where a large number of trees had been pushed over by a violent wind storm that blew through the area a couple of years ago. It appears the wind came over the top of the mountains, then pushed down into the valley. It is sad to see these beautiful trees laying on the ground in defeat of the wrath of nature. You will notice the tress are pointing down-hill indicating the wind direction came from above. Our climb into Cades cove peaked at 2012 feet (according to our GPS). That makes the trip a climb of about 1,000 feet from Townsend. Just beyond the peak is the entrance to Cades Cove. We stopped at the visitors center to pick up an information brochure that included a map of the park. 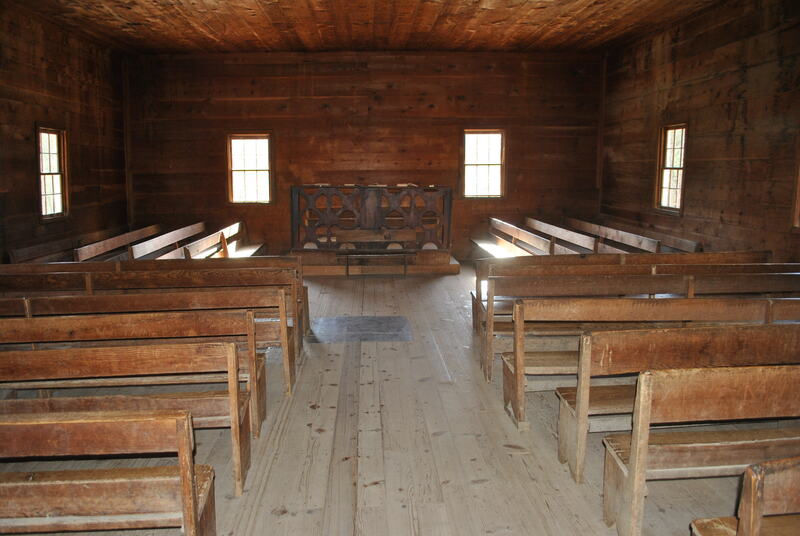 You can read more about the history of Cades Cove by clicking here. 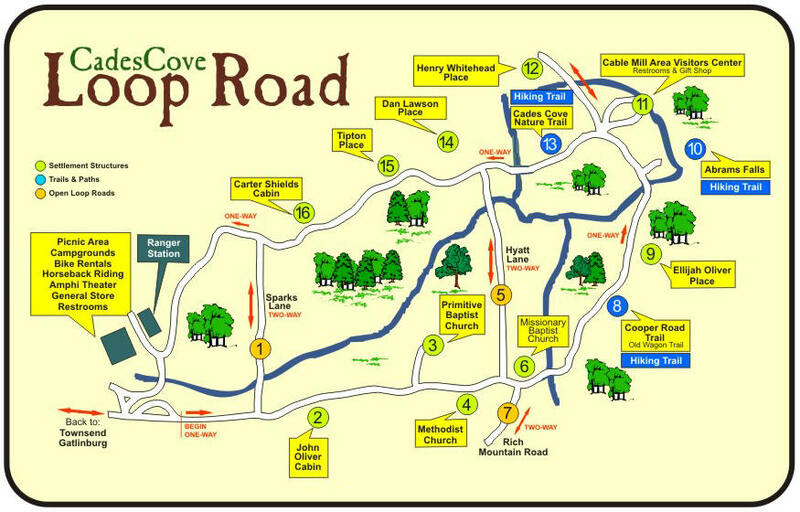 The main loop through Cades Cove covers 11 miles. The map below shows the loop and highlights stops along the loop that should be explored. 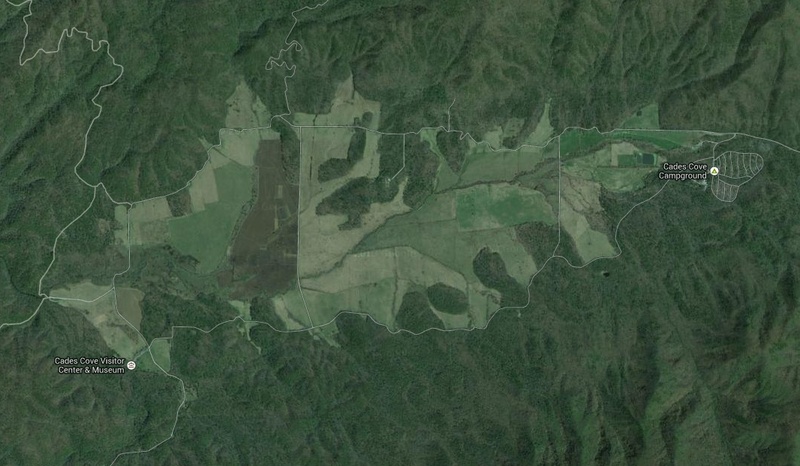 Sparks Lane has been part of Cades Cove since 1840. Other than offering a different perspective of the cove, it offers a means of crossing the cove. John Oliver’s cabin is the first stop on the loop. 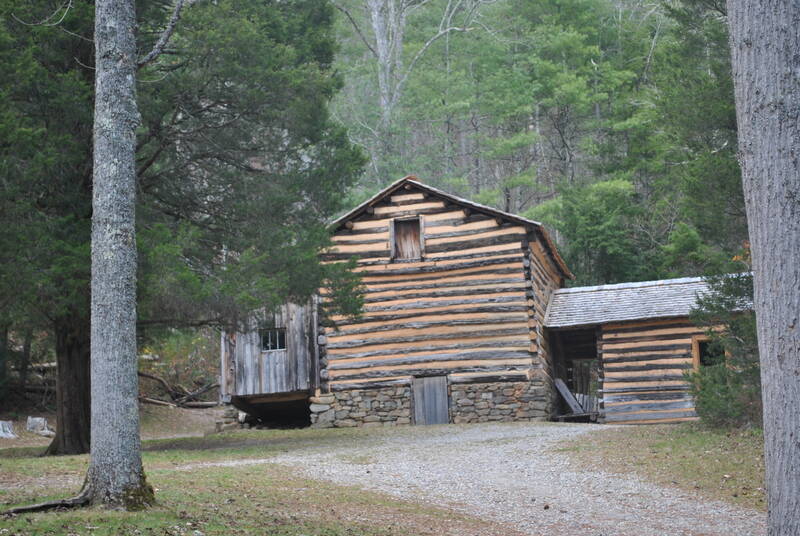 This is one of over 80 historic buildings in Cades Cove and provides visitors a glimpse of life in the 1800’s. John Oliver most likely cut the trees needed for his cabin with an axe. After cutting the logs to length he notched the ends so the logs could rest one on another and remain in place without additional fasteners. 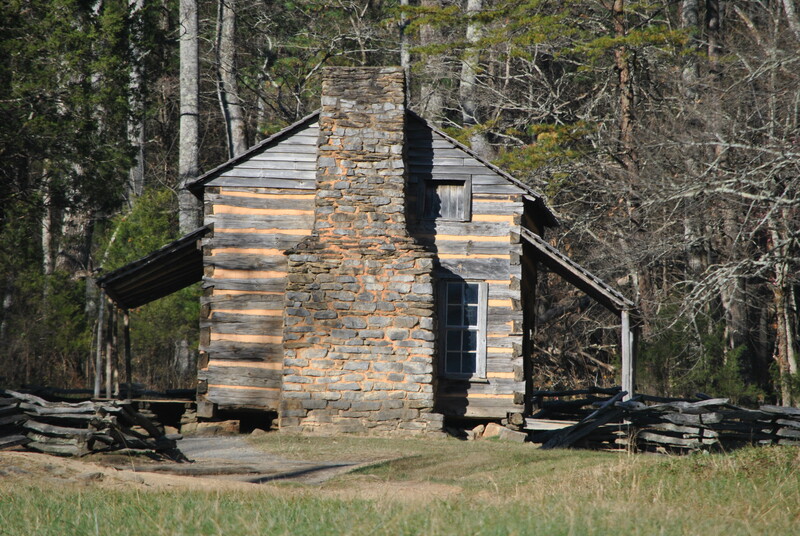 The cabin remained in the Oliver family until the Great Smoky National Forest was established in 1934. John and his wife are buried at the Primitive Baptist Church. This is a view of John Oliver’s cabin as it is approached from the loop. On my first trip to Cades Cove, I did not venture into the cabin. That will come later. You can see the logs were squared up a bit and the mud between the logs is in place to keep out the cold winter winds. I will post additional photos of this cabin on a later visit. The following photo is the view John Oliver’s family saw as they left their cabin and headed out to work their land in the morning or as they headed out for church on Sunday mornings. 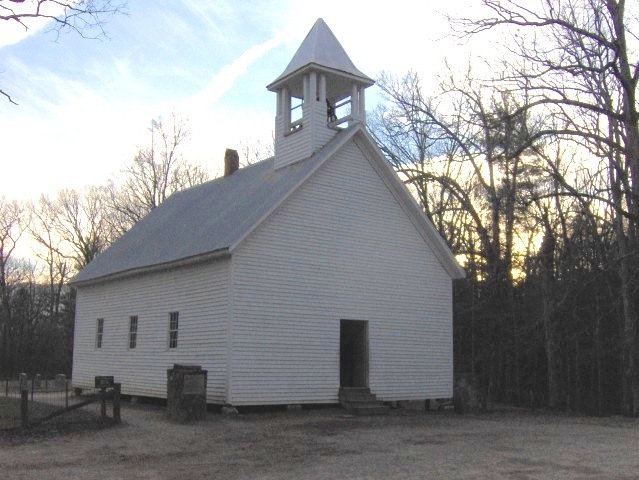 Several early settlers established the Primitive Baptist Church in 1827. Initially they constructed a log building that served their purpose. In 1887, they constructed a new building. The church was closed during the Civil War due to the members being Union folks and most of the cove residents being Rebels. Plus, their pastor had to leave to take care of other business occasionally. 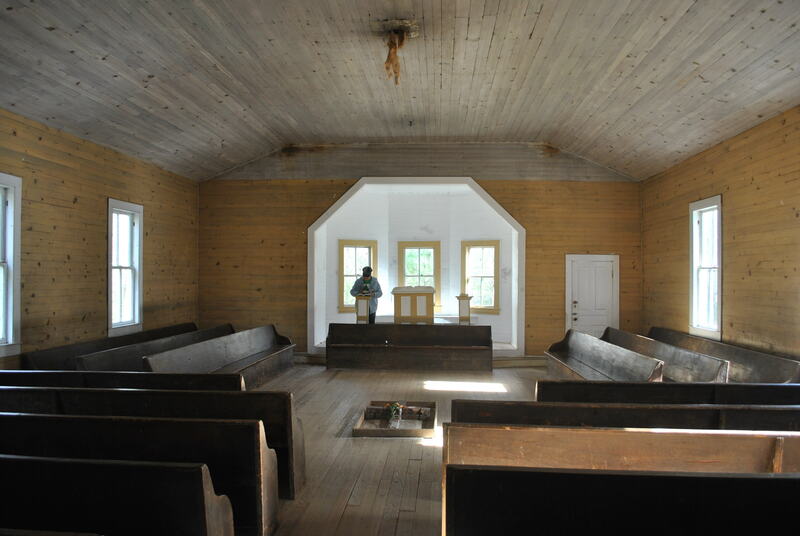 As we stepped into the church, we could almost hear the early settlers singing Amazing Grace. The metal plate on the floor was the location of a wood burning stove that provided heat for the members. We found this interesting headstone of Russel Gregory who found Gregory’s Bald, elevation 4,949 feet. Mr Gregory was murdered by North Carolina Rebel fighters in 1864. We also found John Lurena Oliver’s grave. The Methodist Church is stop number 4 on the loop. This small congregation established in the 1820’s and met in a log building until this current building was constructed in 1902. As we approached the building, we could imagine families gathering for church and kids playing on the grounds. 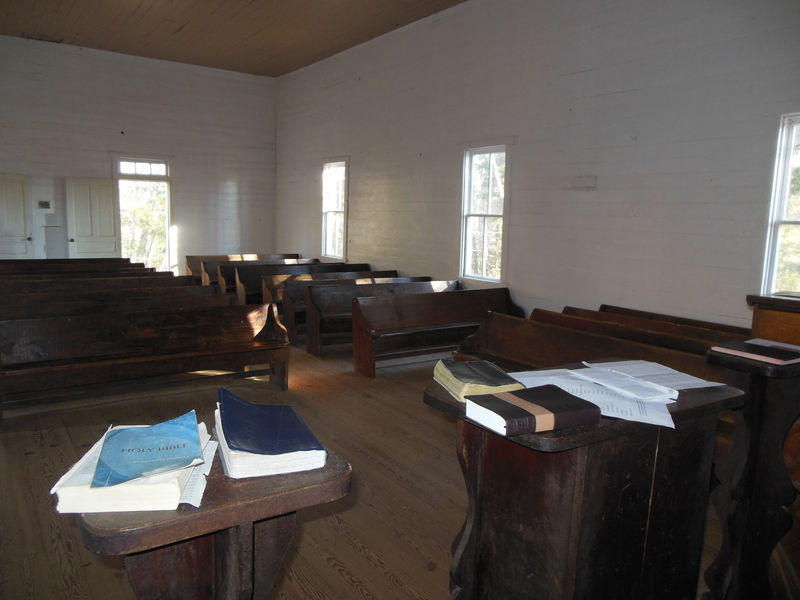 The church looked a bit more modern than the Primitive Baptist Church. We did not notice any signs of a wood burning stove in the center of the room. Visitors leave Bibles, notes and written prayers on the altar of the churches. Each church has its own cemetery. This headstone caught my attention. 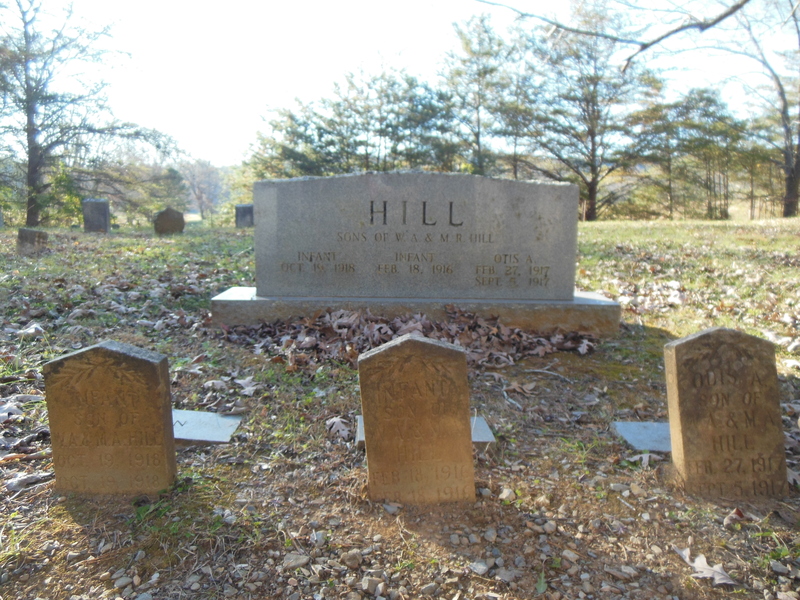 I was saddened to see that the Hill family lost three sons 1916, 1917 (Otis lived 6 months), and in 1918. My dad was born in 1916. The Missionary Baptist Church was formed in 1839 when a group from the Primitive Baptist Church was expelled over support of mission work. The church suspended meeting during the civil war and resumed after the war with fewer members. They church closed in 1944. Carol is looking through some of the items left at the altar. A wood burning stove apparently was located in the center of this building. 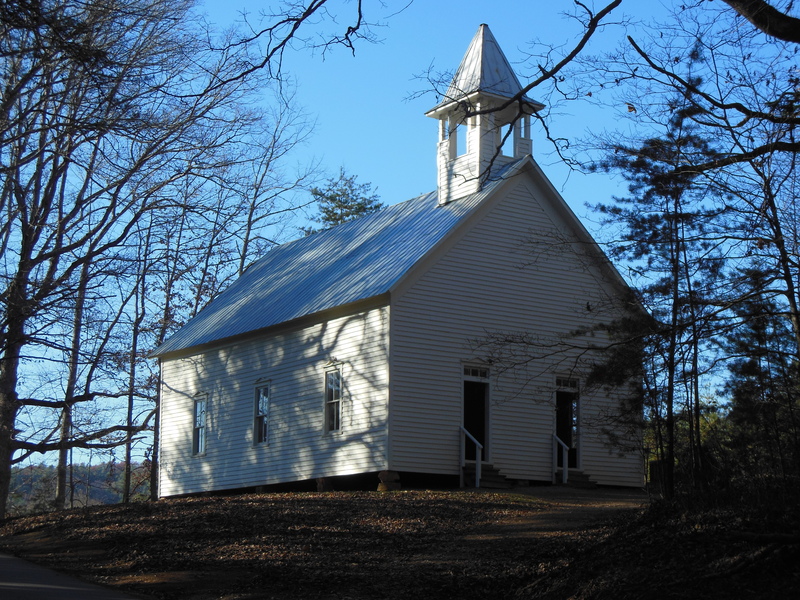 Just across the street from the Missionary Baptist Church is a one way road that exits Cades Cove and leads to Tuckaleechee Cove which is where Townsend is located. Unfortunately, this road is closed during the winter months. We skipped past the Copper Road Trail. This is a 4.3 mile hike to Abrams Creek Camp Ground. For hikers who enjoy primitive camping, this trail if for you. Last stop for the day was Elijah Oliver’s Place. I left Carol in the car and took off on a short .4 mile hike. Elijah Oliver is the son of John Oliver. He left the cove with his family before the civil war but return after the war. This homestead is a sample of the complexity of life in the late 1800’s. This photo shows the main house that was built on a rock foundation. 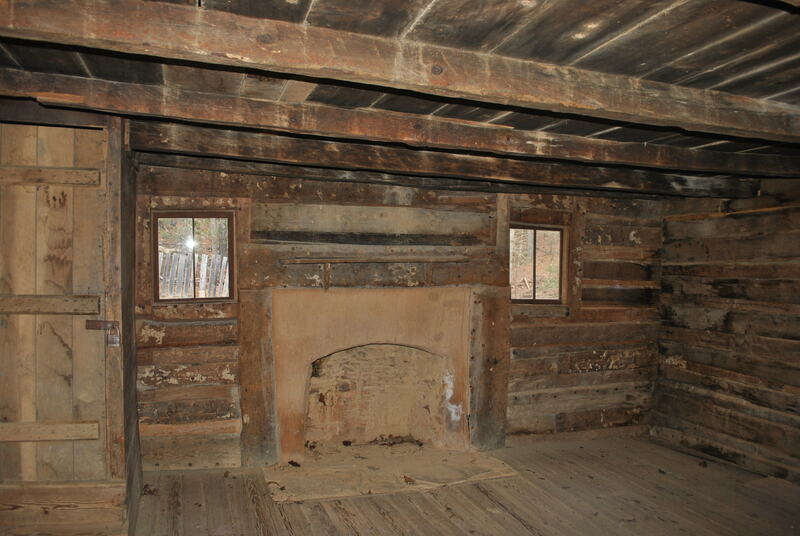 The gray boards on the left was an area of the front porch that was closed in to make a guest room for travelers who would travel through the area. To the right, is a kitchen. The main room consisted of a large fire-place. A spring house is behind the house. Through ingenuous design, water runoff from the mountain was captured in the spring house. This small building was used to store products that needed to be kept cool. The water collected in a log basin that was had cut from a single tree. To keep the basin from overflowing, water flowed out of the basin by way of tree branches that were slotted and stacked. After exploring Elijah Oliver’s place, I was tired and the day was just about over. We stopped at the Cable Mill Area Visitors Center. 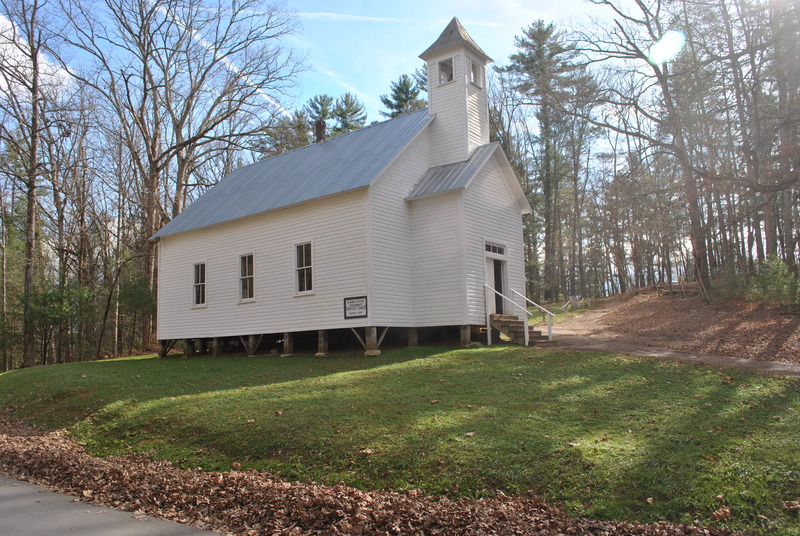 On the next trip to Cades Cove, we will cover more of the structures of Cades Cove and may even venture off to a water fall or two. 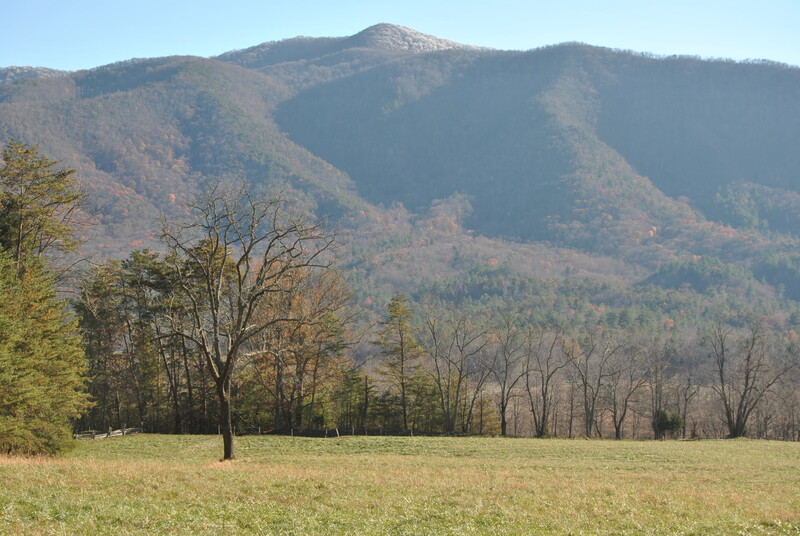 Until then, I leave you to enjoy this panorama of one small section of Cades Cove.